Perforated U Shape Post | BETTER SCREW CO.
3/8" or 7/16"diameter holes on 1"or 2" centers, punched full-length. 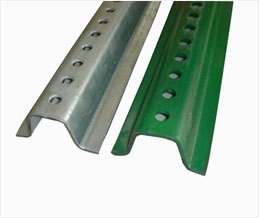 Available in hot-dipped galvanized or green painted. Galvanized by hot dipping per ASTM A123. Tapered ends are also available. Available in any length according to your demand. Yield and tensile strength: 60,000-80,000 psi.